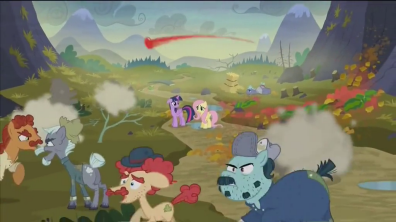 Recap / My Little Pony: Friendship Is Magic S5 E23 "The Hooffields and McColts"
"If you ain't fer us, yer agin' us." While getting ready to start a book club meeting with her animal friends, Fluttershy's cutie mark glows, indicating the map in Twilight's castle is summoning her. Fluttershy arrives, only to find a very eager Twilight Sparkle already waiting. The map has summoned the two of them to a valley in Equestria called the Smokey Mountains which is known for its beauty, with a river running between two mountainous hills. Twilight, along with a "friendship portfolio," travels with Fluttershy to the valley. When the two friends arrive at Smokey Mountains, they're suddenly set upon by pumpkins being launched from one of the peaks. Upon investigating, they find a family of earth ponies called the Hooffields launching food at the other peak, which holds a family called the McColts. The Hooffields are expert farmers, while the McColts are expert builders, and the two families are engaged in a bitter feud. Twilight and Fluttershy attempt to get to the root of the problem, but are constantly stymied. At first, the families simply dismiss their attempts, but further investigation reveals that neither family really knows what started the feud, or why they keep going. However, neither family is willing to back down. Finally, Twilight seems to have convinced Ma Hooffield to make peace by baking a large cake, bringing it to the McColts. But the Hooffields hid inside of the cake, and emerge once it's inside the McColt fort. This triggers a massive brawl between the two families, with Twilight all but giving up on solving the problem. While Twilight sulks away from the fighting, Fluttershy sees several hungry, cold animals in the area, who tell her all about how the feud really started. Twilight uses a spell to freeze all of the Hooffields and McColts in place while Fluttershy explains: the feud started when their ancestors Grub Hooffield and Piles McColt wanted to preserve the valley and protect the animals, but couldn't agree on how to do it. Grub wanted to start growing crops for the animals to eat, whereas Piles wanted to build a shelter for the animals to live. Since both of them were insistent on doing things their own way, and neither one was willing to back down, they eventually began sabotaging each others efforts. Their arguing turned into a full-blown feud with each other that eclipsed their original goal to preserve the valley, a feud that their descendants are now pointlessly continuing. The Hooffields and McColts finally see that they've been fighting over nothing and, after realizing how their fighting has hurt both the land and the animals, they call a truce. As the two families come together to start farming and building, Twilight and Fluttershy's cutie marks glow, indicating they solved the problem. They begin heading back to Ponyville, with Twilight wondering out loud that, now that the map has summoned all of the Mane Six, where they'll be sent next. Adorkable: Twilight explains how she feels about finally being called by the map as feeling a little "skiddly-bopty-boo." Who else would use terms like that? Continuing to fight will never settle anything. Don't get so focused on debating over how to help something that you end up forgetting and neglecting the very thing you wanted to protect in the first place. Fighting will only hurt everyone around you. Vengeful Grudges are one of the worst sins that an individual can steep into. Not only that, but even a long-lived grudge can originate from even the pettiest of reasons. Applicability: In-universe. Fluttershy's book club is studying "the theme of nature as it applies to Hoofcliff's love" in Wuthering Hooves. Applied Mathematics: The blackboard Twilight points to when she says she's been "testing out potential friendship problems" has many parts of the equation replaced with Cutie Marks and smiling ponies. Battlecry: The Hooffields jumping out of the Trojan Cake yell "For glory!" Big Ball of Violence: Several occur during the big fight between the Hooffields and McColts. The Big Guy: One of the McColt stallions has the same body structure as Trouble Shoes, towering over the other ponies. Big Ol' Eyebrows: The Hooffields (including the mares, save for one) have big bushy eyebrows that would put Tree Hugger's to shame. The McColts' aren't small either, but not as noticeable since theirs are straight. Big Ol' Unibrow: Big Daddy McColt sport a unibrow among plenty other facial hair, not helping his already gruff appearance. Blinding Bangs: The Hooffields are all quite hairy, but one even has his frizzy mane entirely covering the eyes. A Bloody Mess: Used together with a Parodied Paint the Town Red when Ma Hooffield calls to reload the tomato slingshots and "paint their mountaintop red". Bluegrass: The genre that the background music changes to once we're introduced to the feuding clans. Each of the families has its own Leitmotif. The plot is kicked-off by the Hooffields attacking the McColts with pumpkin barrage. This is in retaliation to their retaliation that ruined their supply of food, meaning the McColts have to salvage the pumpkins as their only source, which isn't that bad taste-wise but will get old. At the end when everyone is made up and both sides are offering their services to each other's shortcomings, where the Hooffields explain they're going to provide the McColts with some crops, a McColt stallion pops in asking for no pumpkins. The episode begins with Fluttershy hosting a book club with her animal friends before her cutie mark starts glowing. Later on, when she's planning to rescue all the animals left cold and hungry from the constant fighting, she asks them how they feel about book clubs. Buffy Speak: Ma Hooffield loves gerunding Edible Ammunition. The Cameo: Spike is briefly seen reading a comic under a pile of books, which Twilight briefly lifts up before going back to her business. Camera Abuse: During the tomato bombardment, one strikes close to the "camera" and covers it in red. Can Only Move the Eyes: The ponies that Twilight immobilizes with her freeze spell can still move their eyes and mouths, allowing to see some range of expression as Fluttershy's story on how the feud started sinks in. Caught in a Snare: The Hooffields that jump out of the Trojan Cake are a big surprise for the McColts, but they're nevertheless promptly caught in a net by the fort's inner defenses. Cherry Tapping: The Hooffields are so terrible at building that all the McColts have to launch to knock down their buildings are pebbles. Circular Reasoning: The whole reason the Hooffields and McColts continue feuding. When they aren't fighting, they're getting ready to fight, and what they hope to get out of fighting is the satisfaction of winning... the fight, to prove their family is the best... at winning. Colour-Coded for Your Convenience: The Hooffields are generally reddish coat colors, while the McColts are blueish. This in fact was by design based on the Looney Tunes short "Hillbilly Hare". When Twilight turns around suddenly to show off her glowing cutie mark, Fluttershy cringes as she barely avoids getting slapped in the face by her tail. Clearly, she remembers this happening twice to her with Rarity's mermaid costume in "Scare Master". When Twilight is speculating what kind of friendship problem they could be dealing with, she lists off several that already happened in earlier episodes. Oddly, Twilight was largely involved in one of the episodes referenced. Twilight pulls out the freeze spell from "Castle Mane-ia", even noting that it's a lot harder to hold all these ponies than just her friends. This hasn't been the first time Twilight was accused of being a spy for another side. Crazy-Prepared: Twilight tries to invoke this when she's finally summoned by the map, but when she finally gets to the Smokey Mountains, she discovers that it was all for naught. Crippling Overspecialization: The Hooffields are excellent farmers but are useless at construction, whereas the McColts are experts at building, but have poor to nonexistent farming skills. Of the "You said X twice" variety. Twilight: I've prepared our things. Snacks, books, blankets, books. Fluttershy: You said "books" twice. Twilight: There are a lot of books. The icing on the "apology cake". Fluttershy: Nothing says "Let's be friends" like a cake that says "Let's be friends". Double Take: In The Teaser, Fluttershy distractedly notes that her cutie mark is glowing, before turning back to her book. Then she snaps back to it when she realizes what it means. "Down Here!" Shot: "Big Daddy" McColt is introduced this way, the shot at first only showing his very tall hat, before moving down, very deliberately pointing out his Ironic Name in the process. Eat Dirt, Cheap: In the flashback, Grub Hooffield tests whether the dirt is good for planting by eating a hoofful with every sign of enjoyment. Edible Ammunition: The Hooffields bombard the McColts with pumpkins, tomatoes, and other food. This is actually ends up benefiting the McColts; since they're completely inept at growing their own food, they salvage whatever the Hooffields fire at them. Escalating War: How the feud started. The families' forefathers, Grub Hooffield and Piles McColt, ran into a small disagreement, then inconvenienced the other until it was flat out war. Fantasy Counterpart Culture: The titular clans are clearly meant to be Appalachian hillbillies, specifically the Hatfields and McCoys. Oddly, Grub Hooffield's characterization is closer to that of "Old Ranel" McCoy and Piles McColt is closer to "Devil Anse" Hatfield. Feuding Families: The basic premise of the episode involves a bitter feud between the Hooffield and McColt families. The kicker here is that neither side can recall what started the feud in the first place. The families' crippling overspecializations are hinted at by the mountains their respective lands occupy. The Hooffields have pumpkins growing everywhere surrounding their peak, but their houses are ramshackle and badly built. The McColts' compound at their peak looks like a sturdy fortress built out of logs, but they have nothing but stumps surrounding their land, with no crops whatsoever. The significance of the animals struggling for both food and shelter is also hinted at before Fluttershy learns the truth, generally by her theme for her book club, and more specifically during the various battles between the clans. Freeze-Frame Bonus: Three of the McColts appear to be triplet sisters as their cutie marks are various types of saws. Freudian Excuse: Piles McColt technically started the war by setting up his first house right where Grub Hooffield was going to plant his first field. Grub then helped kick off the war with an even more inconsiderate act by knocking down Piles' first house. The McColts nodding to Big Daddy's statement is accompanied by light whinnying. Twilight shakes herself like a dog to get rid of tomato juices and bits clinging to her coat. Genre Blind: Neither Twilight, Fluttershy or the McColts anticipate the "Trojan Cake" filled with hostile ponies... quite unlike a good part of the audience. The McColts are the most stereotypical hillbillies imaginable. They are also all varying shades of light to medium blue. This seems normal in a world of Amazing Technicolor Population. However, it's been noted that the genetic condition methemoglobenemia results in blue skin; the most famous case is from the area of the Hatfield-McCoy feud (and actually later married into the McCoys) and is the result of frequent inbreeding. One of the Hooffield mares is wearing a dress that, in contrast to other dresses that we've seen ponies wear and their human equivalent, would have an extremely low cleavage cut. As Cheezburger pointed out , Twilight's big freeze spell is just in time to prevent one McColt mare from flat-out killing a Hooffield one with a shovel. The McColt family patriarch is named Piles. In building, a pile is a post or column driven deep into the ground as part of a structure's foundation; however, "piles" is also a slang term for hemorrhoids. The Gloves Come Off: Twilight tries very hard to settle things peacefully between the two feuding families, by talking it out and staying rational, rather than using her powers or princess authority. However, when she's hit by a cupcake in the face during the big brawl, you can tell that she's fed up with the fighting. Next thing, she's using a massive immobilizing spell encompassing all the belligerents in the field. Green Aesop: Sort of. The valley used to be beautiful, but much of that beauty was destroyed when the ponies started focusing more on their feuding than protecting the land like they originally came there to do. Growling Gut: The guts of a squirrel and a few mice are growling loud enough for Twilight and Fluttershy to notice. This clues them that the critters are starving, and that the valley's problem concerns not just the two feuding families. Head Desk: She has no desk, but once Twilight gets frustrated by the Hooffields and McColts' circular logic, and concludes she just can't find the root of the problem, she simply slams her face on the ground. Heart Is an Awesome Power: Fluttershy's ability to communicate with small woodland creatures proves to be the reason the Map summoned her because only the critters remember how the feud started. Heroic BSoD: When the big brawl breaks out, Twilight walks off and sulks, convinced that they'll just start their feud back up no matter what she does. Fluttershy getting the story from the animals snaps her out of it. Hold Your Hippogriffs: Fluttershy expands the "everypony" theme with "everyanimal" when addressing her Furry Friends Book Club. Hope Spot: A giant cake made by the Hooffields when it arrived to the McColts' compound due to Twilight's suggestion. Lampshaded by Twilight herself when she said it would be the first step toward forgiveness. That's when several Hooffields explode out of the cake and attack the compound from the inside. Hyper-Awareness: In a blink-and-you-miss-it moment, Twilight can be seen using her magic to pull Fluttershy out of the way of a launched pumpkin, even as Twilight herself had her back turned at the time. It seems she's picked up on Rainbow Dash's own flight awareness capabilities. Twilight doesn't seem to notice that Fluttershy can barely carry the saddle bags she (Twilight) can transport without breaking a sweat, at least when they're walking; once they're flying, she finally notices and offers to help Fluttershy with the bags. The feuding families don't notice how their fighting is hurting both the valley and the animals; Fluttershy has to save the animals more than once, and the families only notice this after Twilight freezes them with her magic, and force them to listen to Fluttershy. Ironic Name: "Big Daddy" McColt is a Miniature Senior Citizen. Jumping Out of a Cake: Not a festive example, as several Hooffields are jumping out of the "apology cake" used as Trojan Horse to attack the McColts from inside their fort. Lady Looks Like a Dude: One of the McColt mares has the exact same body structure as her stallion siblings, with the only discerning differences being the show's usual Tertiary Sexual Characteristics, as well as her voice. Make Me Wanna Shout: More played for laugh than anything else, but when Big Daddy McColt yells toward the mountaintop of the Hooffields, the force of his scream causes their ramshackle houses to crumble. Not that it would take much considering their professed ineptitude at construction. Mass "Oh, Crap! ": The entire McColt clan when they see the Hooffields jumping out of the Trojan Horse cake. Meaningful Name: Piles McColt is named for piling , which helps make buildings more sturdy. Miniature Senior Citizen: Big Daddy McColt, as his name doesn't indicate, is a midget elderly pony, a fact that is made fun of from his very introduction. It's all the more noticeable since the other McColts as a whole are rather big ponies, even the youngest-looking mares being taller than alicorn Twilight. Mistaken for Spies: Twilight and Fluttershy are initially accused of being spies of the opposite family when they first meet each side. Monochrome Past: The flashback to Grub Hooffield and Piles McColt's arrival in the valley has muted colors with a sepia tint. Motive Decay: The feud between the Hooffields and the McColts has gone on so long, that they forgot why the feud started in the first place. It takes Fluttershy talking with the local animals to figure out that the feud started because they disagreed on how to best take care of the animals. My God, What Have I Done? : Once Fluttershy has explained how the feud started and what it has done to the animals and the valley, both families show expressions of this as the guilt and remorse of their actions set in. My God, You Are Serious: "Wait, you were serious about apologizing? WHY IN EQUESTRIA WOULD WE DO THAT?!" No-Sell: A beefy McColt stallion doesn't even flinch when a Hooffield tries to grapple with him, but just pushes him effortlessly away. Off-Model: Twilight has ordinary pegasus wings when expressing her excitement over being called by the map instead of her usual unique wings. Orange/Blue Contrast: The feuding families, the Hooffields being warm shades of brown, red and orange and the McColts being cool shades of blue, teal and violet. Paint the Town Red: Parodied by means of A Bloody Mess when Ma Hooffield calls to reload the tomato slingshots and "paint their mountaintop red." Perma-Stubble: One of the McColt stallions has some rather scruffy, unshaven facial hair in addition to his mustache. Pie in the Face: Twilight is hit by a stray cupcake in the face during the big brawl. As she was already running out of patience with all the fighting, this happens to be the last straw. Poor Communication Kills: The feud started because Pile McColt built a barn over Grub Hooffield's future farm plot. Rather than either side talking to the other, they just decide to sabotage the other's goals. This could also be applied to the later generations, where neither side was willing to talk to the other and arrange peace, preferring to just be angry and continue feuding. Power Echoes: Twilight yelling "EVERYPONY FREEZE!" gets a lot of echo on the last word. No surprise considering the sheer power of the ensuing spell. Produce Pelting: The main way of fighting for the Hooffields is to throw fruits and vegetables at their McColt foes. At one point, while Twilight and Fluttershy are seeking shelter, both get hit with a barrage of tomatoes. Red Oni, Blue Oni: Just like in "A Bird in the Hoof", Twilight is the Red (more outgoing and assertive) to Fluttershy's Blue (more sensitive and given to listening first). Riding into the Sunset: How the episode ends, with Twilight and Fluttershy heading in direction of the sunset. Except they're not riding, because, you know, ponies. They're more like walking... at a snail's pace in Flutteryshy's case, because of the weight of her satchels, again. Scenery Gorn: The Smokey Mountains are shown, in Twilight's book and in the flashbacks, as a pristine natural paradise. In the modern day, they've been turned into a scarred wasteland by generations of feuding. Series Continuity Error: Twilight remarks that she previously froze six ponies, when in fact — assuming she's referencing the incident from "Castle Mane-ia" — she really only froze four. Shaming the Mob: Fluttershy calls the Hooffields and McColts out for letting their petty feud escalate to the point of nearly destroying the valley their ancestors set out to protect. Cue both families having a My God, What Have I Done? revelation. Shaped Like Itself: "Did you say cake? As in... cake?" Fluttershy's book club is reading a pony version of Wuthering Heights, which, if you know anything about the book, is just as surprising for Fluttershy to be a fan of as those animes. The book also sports a ponified version of Catherine on the cover. To Forrest Gump, when Big Daddy McColt rattles off many pumpkin dishes that they have to make using the pumpkins the Hooffields throw at them. Two feuding settlements on mountains on either side of a valley tossing odds and ends at each other is similar to the VeggieTales version of "The Good Samaritan". The feud and the way it's solved is similar to the Avatar: The Last Airbender episode "The Great Divide". The valley resembles the one in the Disney short "The Martins and the Coys", which is also about hillbillies feuding. Both even has a house at the top of each hill. Shovel Strike: Twilight's freeze spell is shown to have interrupted a female McColt from striking a female Hooffield with a shovel. Of course, considering Toon Physics and earth pony resilience, it would have certainly just resulted in Amusing Injuries. Spit Shake: Between Ma Hooffield and Big Daddy McColt when they agree to end the feud. Part of Twilight's Applied Mathematics chalkboard includes Pinkie Pie's, Rarity's, and Rainbow Dash's cutie marks as "elements" of a molecular model. The McColts are shown to be expert carpenters, and three of them, as mentioned under Freeze-Frame Bonus, have saw Cutie Marks. They're sawhorses. Straight Man: Surprisingly, Fluttershy is this to Twilight Sparkle throughout this episode. Twilight is too focused on solving the problem by-the-book through following her notes to see the bigger picture. Suddenly SHOUTING! : Big Daddy McColt has a tendency to raise his voice without warning during conversations, mostly each time he says "the Hooffields". The Theme Park Version: The Feuding Families are very loosely based on the feud between the Hatfields and McCoys. Theory of Narrative Causality: Neither Fluttershy nor Twilight questions why the Map has specifically summoned them. After the events of "The Lost Treasure of Griffonstone" and "Made in Manehattan", they understand from the beginning that they were summoned because they're the right ponies for whatever friendship problem is at hoof. Third Time's the Charm: After being passed over the first two times to go somewhere for a friendship problem, Twilight finally gets picked for a mission. Trojan Horse: Ma Hooffield's supposed "apology cake" has several Hooffield members hidden inside it, who attack as soon as they are inside the McColts' fort. Bonus for real horses being involved. Uncanny Family Resemblance: The Hooffields are a family of warm-colored earth pony farmers with curly, frizzy hair whereas the McColt clan are a family of blue-hued earth pony builders with straight hair. Given the normal variations of color within pony families, this suggests each clan has its own Tangled Family Tree. Unreliable Expositor: Both the Hooffields and McColts have their own inconsistent, clashing stories as to how their personal war with the other clan, spanning several years and generations, had started. Their stories are so unreliable that they've completely forgotten the actual reasons that caused their war and are too preoccupied with fighting to even care about remembering what they were. Untrusting Community: Both the Hooffields and McColts are suspicious of Fluttershy and Twilight's intentions when they first arrive, with both clans assuming they're spies at first. Unusually Uninteresting Sight: Zig-zagged starting from an aversion; Ma Hooffield seems too paranoid and focused on their feud with the McColts to take any exception to a new alicorn princess, but the stallion sentry at the McColt stronghold holds a short conversation with Twilight about the fact that there's a fourth princess. Both sides have been rather out of the loop because of their conflict. Implies some Fridge Brilliance at the earlier instances of this trope being played straight, as Twilight's coronation was surely news spread throughout all of Equestria. Utility Magic: Twilight Sparkle uses a simple spell to amplify her voice enough that she's heard from both mountaintops. We Used to Be Friends: Grub Hooffield and Piles McColt were two friends who wanted to help the animals in the Smokey Mountains. Disagreements over how to help and constant sabotaging ended that and escalated into a feud their descendants continued without knowing why. With Us or Against Us: Big Daddy McColt says this directly in response to Twilight stating that she's not here to help them fight against the Hooffields. Big Daddy McColt: If you ain't fer us, yer agin' us. Whole Plot Reference: The title and plot of the episode are based on the Hatfields and McCoys , two families from the American Appalachians who were engaged in a bitter blood feud for decades. World Building: The episode introduces us to the Smokey Mountains, which seem to be an Equestrian analogue for the Great Smoky Mountains , part of the Appalachians in the eastern United States (although in the world maps from the show, the mountains are towards the western side, north of Las Pegasus). The ponies living there even speak in a dialect associated with that region. Wrestler in All of Us: During the big free-for-all, a Hooffielfd mare catches a McColt mare in a painful-looking hold by bending her leg backward, and the latter repeatedly slaps the ground with her hoof. You Know What You Did: Both families' explanation for how the feud started boils down to this. Twilight sees this as a sign that neither of them knows what the other did. My Little Pony: Friendship Is Magic S5 E22 "What About Discord?" My Little Pony: Friendship Is Magic S5 E24 "The Mane Attraction"